The Prairie Schooler counted cross stitch patterns. Unique and beautiful designs. 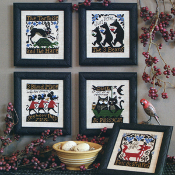 Just in Happy Christmas three lovely designs featuring Santa and his reindeer.